Willie Colon was hit with a 15-yard unsportsmanlike conduct penalty on Sunday, even though he's out for the year. Here’s something that probably doesn’t happen too often in the NFL. 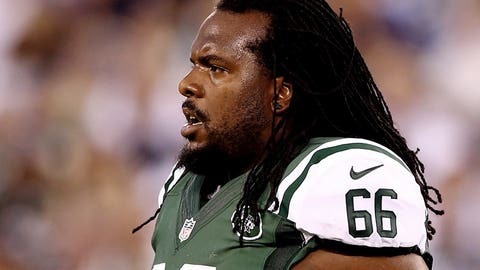 New York Jets guard Willie Colon is on injured reserve with a knee injury, but he found a way to hurt his team on Sunday despite being out for the year. After Jets quarterback Ryan Fitzpatrick found Eric Decker for a 17-yard gain in the second quarter, Colon started talking trash to New York Giants cornerback Dominique Rodgers-Cromartie. Colon was then flagged for a 15-yard unsportsmanlike conduct penalty, negating the gain. It may not be the first time a player has been flagged while on injured reserve, but it certainly doesn’t happen very often.